The Beauty of Life: Beauty Question: How Often Do You Wash Your Makeup Brushes? Beauty Question: How Often Do You Wash Your Makeup Brushes? In keeping with the spirit of my latest giveaway, I have a new Beauty Question for all my fellow beauty chicks. How often do you wash your makeup brushes? I don't mean a quick tapping off of the powder or quick run under the faucet. I mean, how often are you really giving them a thorough cleaning? And to that end, what's your favorite cleaner? Let me know in the comments! I use 99% IPA (isopropyl alcohol) solution. I throw my personal brushes in with my work brushes when Im cleaning between jobs so I probably clean them more often than most. 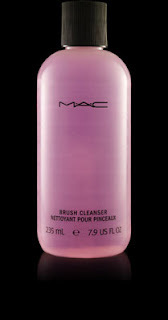 I think everyone should be cleaning their brushes at least once a month to stop bacteria and product build up. I think you get a much better application with clean brushes too! I use a hand-poured cold process soap from Etsy (the same stuff I use to wash my face) and I wash my brushes once a week (usually every Sunday). I've been slacking a little lately though.